Plane arrivals and take-offs at Britain's two biggest airports were largely unaffected by today's strike. But the RMT transport union reported "rock-solid strike action" that had led to "a total shutdown of key transport services in north east England". There were just a few cancellations of inbound transatlantic flights to Heathrow Airport this morning. Despite the positive start to the day, holidaymakers would be well-advised to have travel insurance in place in case they are affected. But Heathrow operator BAA, and its busiest carrier, British Airways, both reported near-normal services, with queues at immigration no longer than usual. And at the second-busiest UK airport - Gatwick in West Sussex - the first 22 inbound flights arrived as normal, with departures also running smoothly. 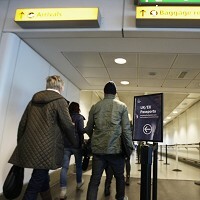 There has been fears that strike action by UK Border Agency (UKBA) staff would lead to chaos at Heathrow, where BAA had asked airlines to fly planes half-full today. A British Airways spokesman said: "We've had a positive start to the day and queues are pretty much as normal."